You know the race for the presidency is on when you start seeing huge political fundraising dinners. Actor George Clooney recently hosted one for President Obama where the cost was $40,000 a plate. Mitt Romney and the Republicans, not to be outdone, are having one at $50,000 a plate. These events are great for the campaigns to build their war chest. But all it means for the rest of us is lots of political ads. Not very inspiring. History offers us an alternative. In 1920, Herbert Hoover, almost a decade before he became president, set up fundraising dinners to help millions of people suffering from hunger after World War One. The war, as well as drought, had devastated food production in Europe. Hoover, the head of the American Relief Administration, appealed to the public through a series of fundraising dinners called “The Invisible Guest.” An empty chair was placed at the dinner table to represent one of the hungry “children of famine.” These were innocent victims of war “wasting away in their own homes,”as Hoover put it. War brings hunger even after the guns fall silent. Like many political fundraising dinners of today, the “invisible guest” events had high profile figures attending. 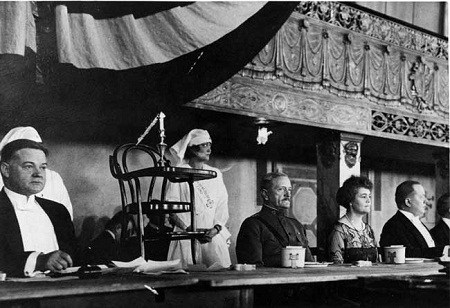 General John J. Pershing, who commanded American forces during World War I, presided with Hoover over one of the “invisible guest” events in New York City. One thousand tickets were sold for $1,000 each at the New York event alone. Guests at the dinner, including John D. Rockefeller Jr., brought total donations up to $3 million dollars that night according to Hoover’s memoir. Other invisible guest dinners took place across the country. What would be inspiring today is to see America’s political leaders revive the “invisible guest” to fight today’s famine. Like post World War I many countries are reeling from conflict and drought. Newly independent South Sudan is in a border conflict with its neighbor Sudan. Many thousands have been displaced causing great hunger and suffering. Children in Darfur, Sudan are also suffering from malnutrition. Drought has also deepened the hunger emergency. UNICEF and the UN World Food Programme are low on funding for relief of children and could be a beneficiary from an “Invisible Guest” dinner. Yemen is also in conflict as the government, backed by the U.S., is fighting Al Qaeda. In the background of this battle is a nation where 22 percent of the population suffers from severe hunger and 60 percent of its youth is stunted from malnutrition. No peace is going to emerge in Yemen under such suffering. The Sahel region of West Africa is being threatened with famine, at a time when East Africa is still recovering from last year’s famine. In terms of children suffering, 2012 is not all that different from post World War I.
Let’s today have a break from excessive political fundraising and have our political leaders come together to benefit humanity when nearly one billion people suffer from hunger. Bring back the “invisible guest” dinners. George Clooney, a humanitarian who has been very active in seeking peace in the Sudan region, could help start this. Article first published as Obama, Romney, Clooney, and an Invisible Guest on Blogcritics. We need to require this from our politicians and not accept that it’s OK to just look out for yourself. Until we do this in our own lives, we’ll probably not ask for it from others. What a great read! I love the concept of the ”Invisible guest” chair. There are so many ways to help others and so many of us pass them by. We train our brains to talk us into saying, ”My single contribution won’t make a difference”, or ”I would donate but most of the money doesn’t even really go to help them”. In reality this is not the case! Mr. Lambers you make a difference every day and are an inspiration to all.